Quick Answer: Apologetics comes from the Greek word “Apologia” which means defense. It is giving a reason or defense for the Christian faith. 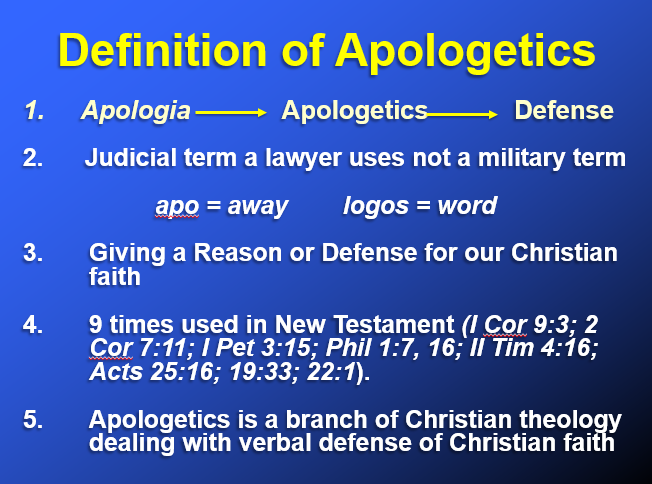 Apologetics is not a military term but rather it is like a defense a defendant makes before a judge. The word “Apologia” is found in 1 Peter 3:15 and translated “reason” - “always be ready to give a reason for the hope that is in you.” Plato used the word apologia to describe Socrates defense in the Athenian court. Apologetics is not grabbing people and throwing them against the wall, but rather a reasoned argument like a lawyer would do in court, it is a conversation we have with people. If we look at the makeup of the word apologetics, it is made of two Greek words, Apo and Logos. The word ‘Apo’ means ‘away from’, and the word ‘logos’ means word – that is apologetics is speaking away a word or accusation that comes towards Christianity. 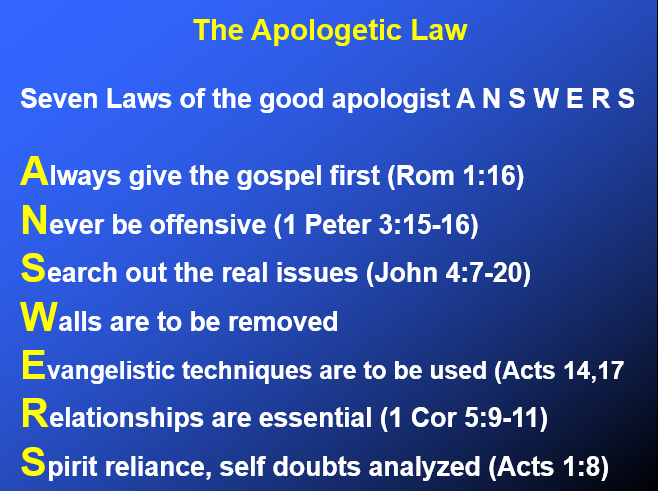 Apologetics therefore is a branch of Christian theology dealing with verbal defense of Christian faith. 1 Peter 3:15 says that we are to “always” be ready to give an answer to “everyone” who asks. If we are always to be ready to give a defense we may as well make it a good defense. For people have good questions and Christians have good answers, in fact they have the truth, and there is no need to be scared to answer anybody. If you don’t know the answer on the spot, just say you will go and find out what it is. The apologist is to be bold in God but not bold with an attitude. We never want to win the argument but loose the person. That’s why we are to speak in humility with meekness. There are two aspects to apologetics, a negative and a positive aspect. The Negative Aspect to Apologetics: This is tearing down arguments that come against Christianity (2 Corinthians 10:5). When the accusations come we are to be ready to answer them. All action is a result of an idea which comes into our mind; we need to be critical about what ideas we put in our minds. Thoughts always result in actions and we can just look at history to see that. For example Hitler first wrote Mein Kampf and then acted out what was in that book. Proper evaluating new ideas and tearing them down if necessary is the negative aspect of apologetics. The Positive Aspect to Apologetics: In this sense we are giving positive information to prove the reasonableness of Christianity. For example giving evidences why God exists, why the Bible is reliable and Christ is risen. It was Aristotle who said an “unexamined life is not worth living”, in the same way an unexamined faith isn’t worth believing. We can positively present proofs for the truthfulness of Christianity, and reasons why they can put their trust in Christ. Apologetics has been described as pre evangelism. Apologetics doesn’t save anyone but it breaks down walls and gives positive reason why Christianity is true. Paul “reasoned” (Acts 17:2-4) on Mars hill “explaining and proving.” It says some were convinced as Paul was persuasive in his reasoning. Apologetics points people to the way, Jesus Christ, but only the Holy Spirit can convict the heart for the person to react positively to the truthfulness of the gospel. Apologetics can show THAT something is true, but the person still needs to put their faith IN. For example apologetics can give many reasons why an airplane is safe to fly, explaining how it is well maintained and able to fly through the air. But apologetics cannot force the person to step in the plain and put their faith IN it. 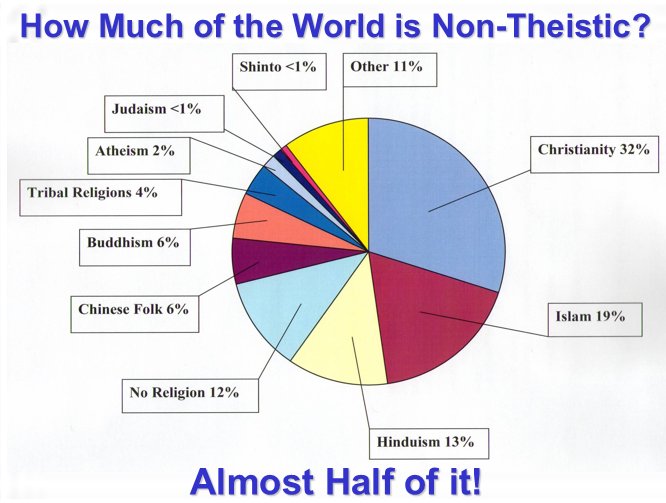 Almost half the world is non-theistic. There cannot be the Son of God, Acts of God, and Salvation from God if there is not a God. Therefore to people who don't believe in God we first need to pre-evangelize them, and prove that God exists. After salvation apologetics can be used to confirm Christians in the Christian faith. If Christians come more persuaded they will be more persuasive to others. The word of God is built on facts and through apologetics proving the truthfulness of the Bible brings assurance to the Christian that their faith is placed on solid ground. Apologetics cannot save anyone. There is a difference between faith that and faith in. Faith that is the area of apologetics, it is proving that God exists, using objective arguments and focusing on the mind. Faith that is always the area of pre-evangelism and is done sometimes depending on the intellectual questions people have. The focus of “faith that’ is how people perceive reality, the focus is the mind using general revelation. “Faith in” is the area of evangelism when we give the gospel. This is something we should do all the time. The will is used when we put faith in something.